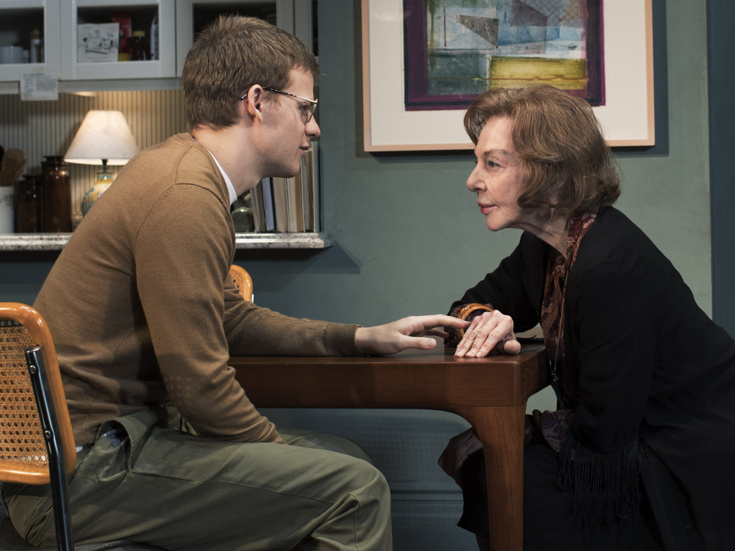 Lucas Hedges & Elaine May in "The Waverly Gallery"
Lucas Hedges is having a strong fall season. In addition to appearing in the new films Boy Erased and Ben Is Back, he is making his Broadway debut in The Waverly Gallery, a Pulitzer-finalist play by Kenneth Lonergan, whose film Manchester by the Sea earned Hedges Hollywood acclaim and an Oscar nomination. At the center of The Waverly Gallery is stage-and-screen legend Elaine May in a return to the Great White Way after more than five decades. Hedges paid a visit to Late Night with Seth Meyers on November 5 to talk about The Waverly Gallery's Broadway premiere and the opportunity to act alongside the beloved May. "It feels like I just get to watch this fireworks display every night," gushed Hedges. "I just sort of watch her." Rounding out the Waverly Gallery cast are Tony winners Joan Allen and David Cromer and Tony nominee Michael Cera, who takes on his third Lonergan role with the work. Watch Hedges and Meyers below and make plans soon to experience the talented company of Lonergan's moving play live at the Golden Theatre.